First and foremost, I do apologize for the delay in this review, both life and the overwhelming amount of content in this last part caused an unplanned delay. To rush this review would have felt like a great disservice to the creator, since this story has proven to be one of the most enjoyable experiences that I’ve had while reading a graphic novel or a comic. The opening notes in this last installment carry a personal dedication from the creator to his mother as she unfortunately passed away during the production of the last installment. As a personal note of my own, if Mr. Jean Paul Deshong should find this humble review of his work: I am sorry for your loss, paradise is a better place with her there. Please check out my previous reviews for the first and second part of this magnificent series. Due to the large amount of content, I will try to be very brief with each chapter’s description, while maintaining a sense of integrity in the review itself. I will not be as descriptive in the scenes and panels as I have been in the past to avoid any unnecessary spoilers, this is the conclusion to a great story. Without further ado, here is Sons of Fate: Revolution. The first chapter, The Ghost of House Jinjaku is set two years after the previous book. The great conspiracy continues with our main character taking the role of avenger in the name of his adoptive family. Taking the name “ The Ghost of the House Jinjaku,” our protagonist has began to carve a path of revenge across those he deems responsible for the betrayal and dishonor of his adoptive family’s house. We see how his actions have caused widespread panic, people refuse to call his name out of fear that he would strike them down. Smithblake is slowly tightening his grip on power while manipulating those around him, and further details on exactly how his forces were able to find this land are revealed. This panic has forced the conspirators to go to extremes to try to quell the unknown killer that is threatening to unravel their plans. The art continues to be magnificent, with the colors helping to convey the emotions within the story. 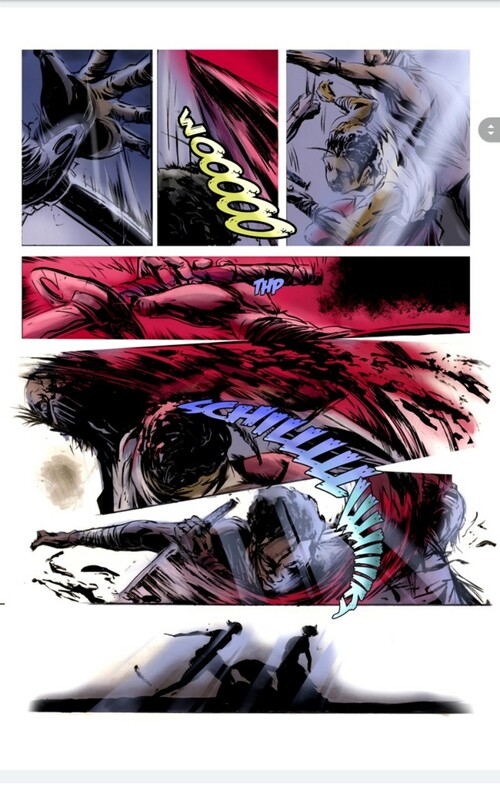 The opening panels have a very chaotic palette which mirrors the current emotional state that the Ghost is experiencing; and the action takes front stage in the opening pages. Once again, small grammatical errors are present, however I was only able to spot one major one that caused me a second of confusion that took me out of the story for a second. However, the story and pace were able to grab my attention just as quick. The second chapter, In the Wild, is a welcomed slowing down to the overall pace of the story, however it continues to setup the stage for the conclusion of this story. The Ghost is captured by rebels that reveal themselves to be loose allies to the Jinjaku. They identify as Ronin, Samurai without a master that live outside Bushido. After testing the Ghost’s skills, they attempt to recruit him to their cause, bringing yet another philosophical point to the reader’s mind. The Ghost identifies these men as terrorists, while they view themselves as liberators, this has been a political philosophy in our world: one man’s liberator is another’s terrorist. The art in this chapter is a slight bit below the previous established standards, however the colors continue to portray the overall emotion in the chapter. The softer palette in this chapter helps the reader to slow down from the overwhelming amount of content in this book. It is a welcomed break that helps establish the current state of the world being created while adding to the narrative in a way that forces the reader to continue reading on. As I read the third chapter, Homecoming, I remembered an old saying: “A man who seeks revenge should dig two graves.” That statement does a great job at summarizing this chapter far more than I could, in short this chapter is heartbreaking. The Ghost is forced to face the consequences of his revenge fueled rampage by facing two harsh truths. The first deals with the true meaning of Jinjaku’s sacrifice, and the other is a more direct consequence of his actions. The two events will help forge his character for the better or the worse, the last remaining chapters will answer that question. The art helps deliver that crushing blow effectively. I honestly had to stop for a second while reading this chapter, I could feel the Ghost’s pain in every panel. 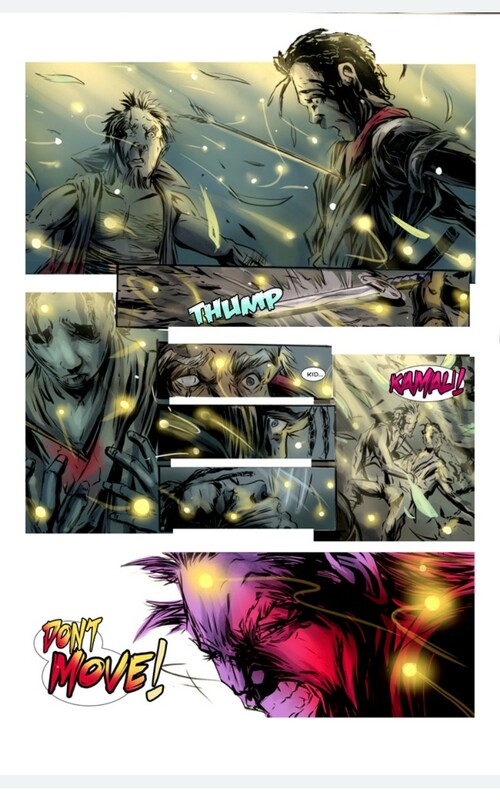 The colors shifting from bright to dark helped create the emotional conflict, and the lettering spreading across panels helps convey the extreme pain being felt. Some of the decorative parts of the speech bubbles made it a little difficult to read, while I understand what effect the creator wanted to create I think it hurts the transitions more than it contributes to the immersion. Chapter four, The Beginning… at the End continues twisting that awful knife that has been pierced into the reader’s heart. The Ghost is given a life choice regarding which path he will follow for his life, a more just life or a life that is consumed by violence. His training continues as the Shogunate’s armies close in on the rebel forces, and while the Ghost continues to remember the lessons he has received from his various teachers, both past and present, his fate is further tested. Once again, the art is superb. I have said it enough times, the colors bring this story to life in a way that no current mainstream comics manage to perform. The lull in the previous chapter is completely shattered, and we return to the non-stop action sequences that are masterfully orchestrated in every panel. Chapter five, The Reason Why and chapter six The Tides of Change cannot be reviewed on their own. 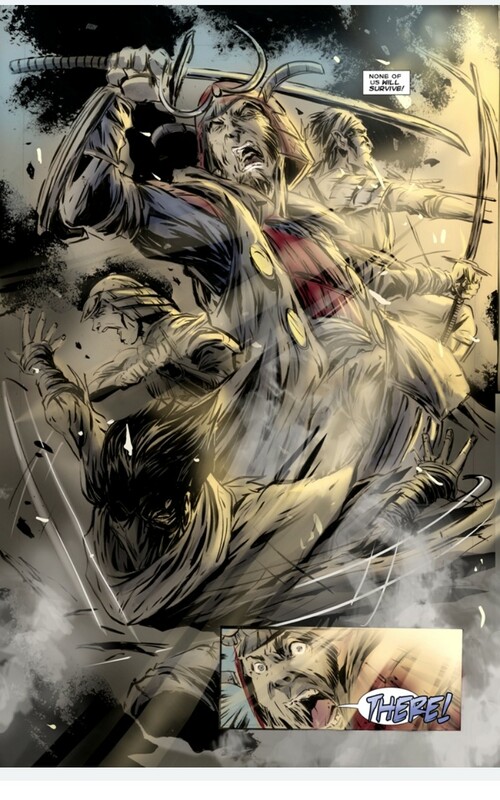 While chapter five continues to lay the foundation of the final path that Ghost must choose, chapter six replays past acts that lay out the dichotomy of Ghost as a rebellious opposite to Smithblake. 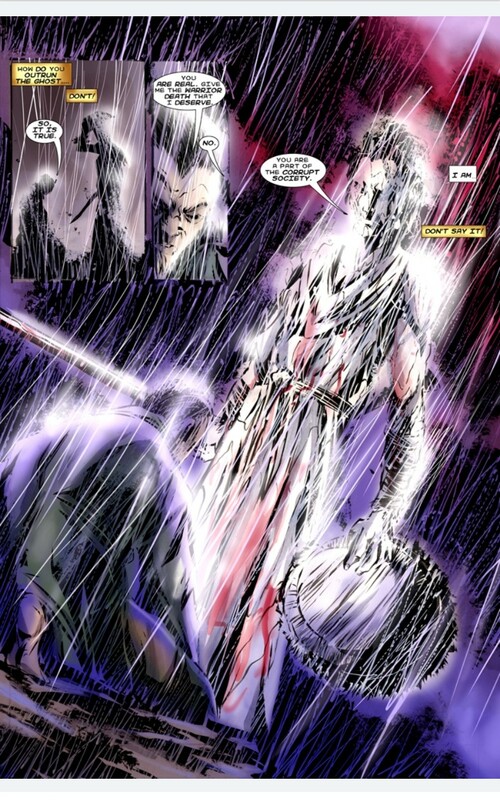 We simultaneously see a flashback and the current situation that plays out theatrically similar, with the centerpieces being the Ghost standing against Smithblake, Smithblake’s treachery is fully revealed as he makes his final move for power, as the Shogun begins to realize the number of errors that he had committed during his reign. Chapter seven, The Price of Power is a fitting conclusion to the journey. This chapter is filled with chaos, blood, pain; war is not a kind mistress. Over a trilogy of books, the journey of a boy from a foreign nation was played out in superb details. 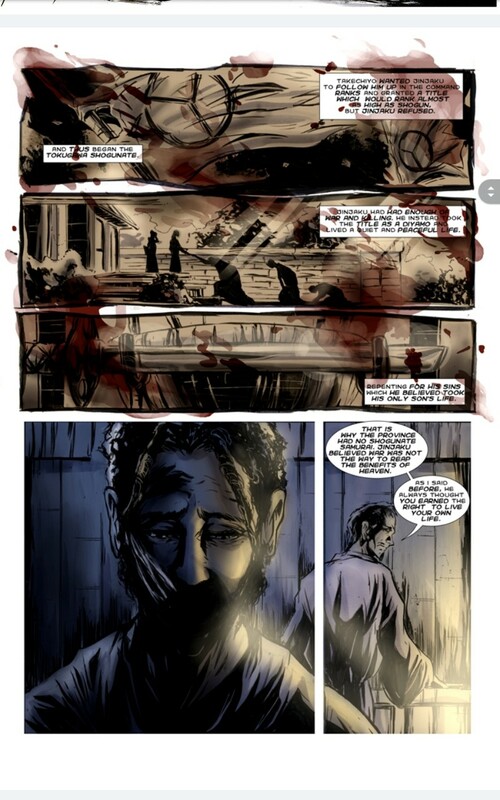 The art work did more than its intended job, the pain of a man trapped in fate’s cruel strings was clearly depicted in each panel. Sons of Fate deserves the 4.5 out of 5 that I rate in this series of reviews. The story wrapper perfectly, carried the reader through a long story that was perfectly paced. The action sequences were done perfectly, this is a violent story that can easily stand beside more traditional mangas that clearly inspired this story. This is definitely a must read book for long standing fans and would make the perfect gift for someone that is interested in this medium. How a major publisher never picked this story up should be a crime that deserves the death of a thousand cuts. I review comics and other pop culture on their own merit. Follow me on Twitter @Call2Mike. Please contact Bleeding Fool if you are a creator and are interested in having me review your work.